It was only 39 degrees outside, but it felt very much like winter this morning. I wore layers top and bottom and was comfortable throughout my entire run. Had I pushed harder, I probably would have overheated. I was in the city yesterday and covered 7 miles on foot. After that, and two moderately tough runs over the weekend, I kept my heart rate around 80% of max for today's workout. 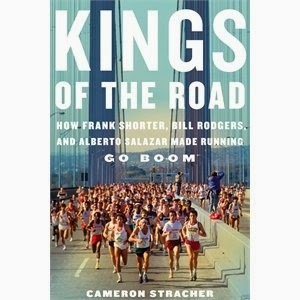 I've been reading a newly published book called, Kings of the Road, that's about how Frank Shorter, Bill Rodgers and Alberto Salazar helped popularize competitive running in the '70's. As I ran today, I thought about my paces versus theirs. In one part, one of these runners described his 4:45 pace at the Falmouth Road Race as "easy." I know that elite runners train so that they are able to sustain high speed over long distances. But how do they mentally prepare themselves to run sub-5:00 paces over 26.2 miles? For that matter, how do 7:00 or even 8:00 milers do it? Is running a half marathon in an hour as hard for Galen Rupp as breaking 2 hours is for me at the same distance? If these elites put everything they have into their races, why do they look so fresh after they cross the finish line? Most people who compete in races push way past their comfort zone. All things being equal, a 4:45 pace, while impressive, is relative to the runner. I have my race targets and it's always great when I meet or exceed them. There are many factors that determine performance on a given run, but lack of trying is rarely one of them. All good questions. I wonder that since those are 'easy' paces for elites, really, they are only running a fraction of the time that we would run. It's probably not until the last 20 or 30 minutes when the 'real' race for them begins. Your point about elites running less time on the same distance is a good one. When I read about these people that casually toss off a 10 miler like it's nothing, I should remember that they're only running around the same time that I take to do 5 miles. I guess at the end of a race it's all out running no matter who you are. But why do those guys look so unscathed after they cross the line? TPP is right. Everyone thought the Bronx woman was going to win right up until Mile 24! Then Jeptoo hit the gas and took the lead. I also thought Meb would finish in the top 5! He wasn't even in the top 20 (He's still a king in my book, though). As far as their appearances at the end of the races. That's like superhero biology. They're barely sweating! I was very surprised when Jeptoo overtook Deba. I think she went out too fast : ( I felt bad for her. I like Meb too. I have a friend who shares the same sports orthopedist. She once chatted for a while with Meb in the waiting room. Even elites need to wait for the doctor! HI guys! Yes.. good running to us all!